Welcome, Guest Login / Register | Why? Only registered users can add plants in my plant list. Would you like to register now? Only registered users can view the my plant list. 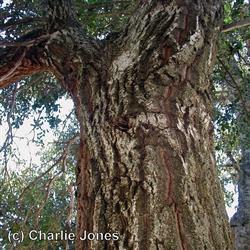 Canyon Oak is the most widely distributed Evergreen Oaks in the state, from Oregon to Baja. The grow in large open vase-like patterns, with acorns that are chestnut brown in color, and leaves that are dark green with spiny lobes and a flat structure. Galls form by beneficial wasps egg placement on branches. Largest Oak is 72 feet in height, 10 feet in diameter, in Palomar Mountain State Park. Can take the form of a low growing shrub, or enormous tree, depending on the soil qualities. Please share your thoughts with us about this plant. We would like to hear about the good things and the problems. We also would appreciate seeing any photos and have you rate this plant. To leave comments or to rate a plant you must be registered. Only registered users can rate for plant. Only registered users can upload image. No comments for this plant.